Volko Ruhnke is rapidly becoming one of the most-recognized strategy game designers in the US, as his COIN series is taking over the world. He’s visited with us before, in discussing A Distant Plain before its release a few years ago. He comes back for a more broad-based look at the COIN series as we ramp up for several COIN events this summer at Origins. GrogHeads: Hey there! Did you have any idea the COIN series was going to take off like it did when you first designed Andean Abyss? When you were working on AA, were you designing with the intent of a “system” or was it just a one-off that you were able to expand? VR: I did not have any idea that the series would take off in the sense of popularity, as my main objective was to bring at least a few wargamers and other boardgamers into some then rather little-gamed topics regarding modern insurgency and counterinsurgency. I did from the start envision a system and a series, and that plan was part of Andean Abyss’s appeal to Gene Billingsley from my first phone call with him to pitch the project. I can document that claim, as the original printing of Andean Abyss says “COIN Series, Volume I” right on the cover, and the ad copy played up that aspect. Because I knew that modern Colombia would be a hard sell to wargamers and Euro-gamers alike, I tried every trick in the design that I could think of to lure each of them in. Launching a series was part of that bag of tricks, as Andean Abyss could promise a future return on the investment in learning a new system by opening easy access to a range of settings in the future volumes. 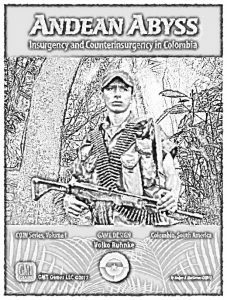 Andean Abyss—Insurgency and Counterinsurgency in Colombia. Bush War—The Fall of Portuguese Angola. [Name TBD]—The Insurgency Against Marcos. Long Hard Slog—The Iraqi Insurgency, 2003-2010. 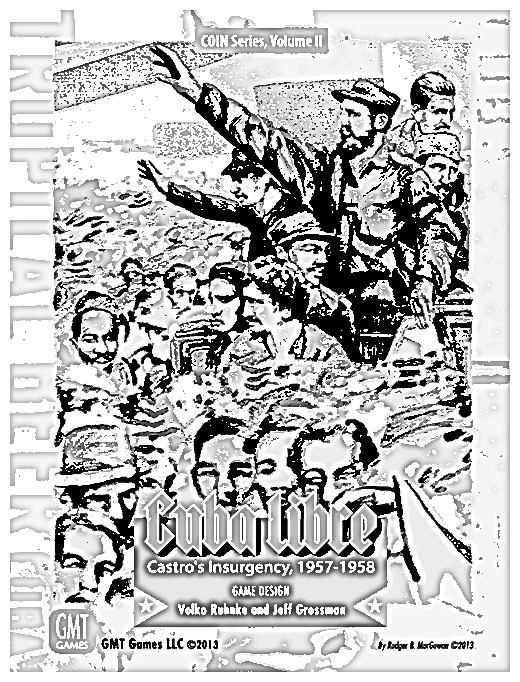 What happened to that was that opportunities emerged to collaborate with other designers—beginning with Jeff Grossman on Cuba Libre—on topics that I would not otherwise have attempted or even thought of. That collaboration, in my view, has been the very key to keeping the Series fresh enough to enable its take off in the prospect now of publishing eight volumes in less than six years. GH: Which of the COIN games have you had the most fun playing with your game groups so far? VR: That’s tough to address, because I naturally love all my children—and grandchildren! In addition, my attention turns to different projects at different times, and different games are fun in different ways. There is a special place in my heart for the first—Andean Abyss—because it was the lonely pioneer, plodding alone along its slow climb up P500. (Gene Billingsley at one point asked on ConsimWorld why weren’t folks ordering it! “Topic” was the most frequent answer.) So I get a special kick now from playing it with friends and fans. As I write this, Volume VI is days from being delivered to players. 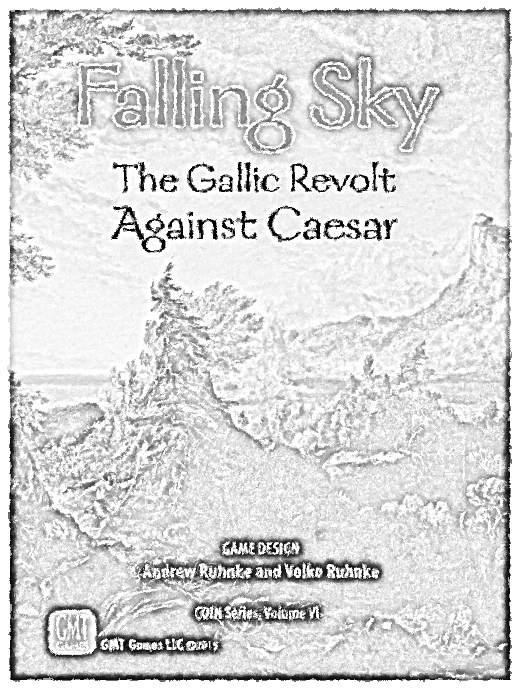 Falling Sky offered me the joy of co-designing with my younger son, and Andrew and I are tickled with the gameplay and model of Gallic revolt against Caesar that we have come up with. The other day I got to play Falling Sky on a production set with my lovely wife and our two boys and I each taking a Faction. Now that was fun of a very special kind! 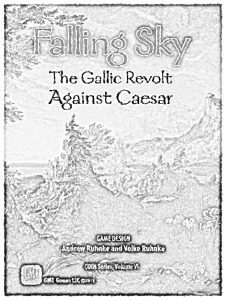 GH: What is it about the COIN system that contributes to its versatility in handling 21st-century Afghanistan, 18th century colonial America, and 4th century Roman Britain with the same set of rules? Warfare—like all mass human affairs—is always multi-factional. All human organizations contain factions within them, all collections of nations in action are encumbered by overlapping but not identical interests, and so on. We can understand even an ostensibly two-party contest like the East Front in WWII only superficially without delving into the complex politics within the German command, for example, or the relations between the German occupier and occupied (an oft-noted missed opportunity for that invader). We certainly can’t effectively model internal wars such as insurgencies recognizably at all without such delving into factionalism. The COIN Series seeks to provide an easy way to model that, through its core sequence of play and its asymmetric victory conditions especially. (Brian Train’s brilliant adaptation of the COIN Series initiative system to 2 players in Colonial Twilight is the exception that proves the rule—but he can tell you about that himself!). Warfare almost always concerns human terrain—and war on land and all internal wars particularly so. All COIN volumes, modern settings back to ancient—somehow show local populations and their sympathies as a central objective on their maps. For most of the Factions in the system, the population is the center of gravity, at least as consequent to strategy and other aspects of gameplay as physical terrain. 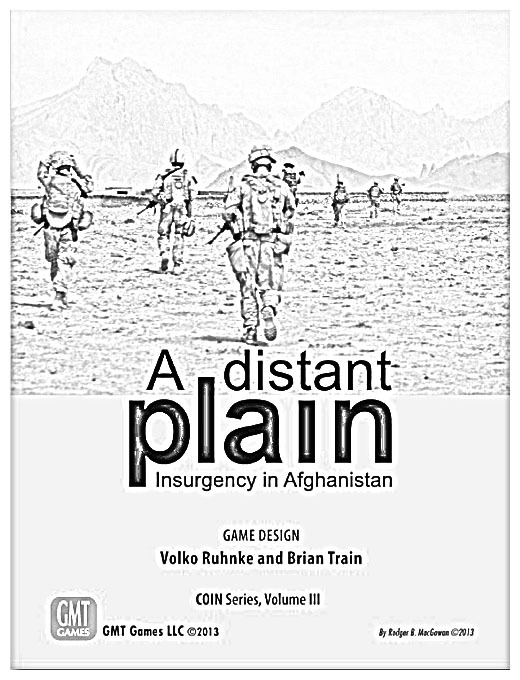 Just look at the COIN Series game boards and their map legends and consider how the addition of simplified human terrain to geography amplifies the asymmetric (and so, I argue, more accurate) victory conditions noted above. Then ask, where is the population in a typical hex-and-counter panzer-pushing wargame, how does that simulation account for it? GH: There’s been some criticism that the COIN system is a very Euro-style system that is just ‘flavoring’ the games with specific conflict overlaid on a common system that’s abstract area control, but not really accurately simulating or recreating key parts of the conflicts. Folks with this mindset are the ones how seem to keep asking “How do the French ‘win’ the American Revolution?” What response would you have to them? VR: All board wargames just flavor a common system that is abstract; none of them accurately simulate or recreate key parts of any real military conflict. Wouldn’t you agree? Models are simplifications of reality. Manual models must be executed by a small number of humans so are simplified a lot. Hobby board wargames—which must be played to be enjoyed fully—so are vast simplifications of the mass human endeavor that is warfare. Hex-and-counter games, like area-control Euros, rely on commonly used conventions, symbols, mechanical tricks, and other such abstractions to very roughly model warfare. Name me any wargame that I have played, and I can tell you how it fails to “accurately simulate”, etc. You can do the same. The interesting question, rather, is what is left in, what left out? I have argued above, in essence, that COIN Series games are in key ways MORE accurate in simplifying to the essence of the national-level wars they depict, in their inclusion of the fundamentals of factionalism and human terrain. GH: What was the inspiration behind developing the ‘bots’ to fill in as quasi-AI players when there weren’t 4 people around the table? Was that built into the original concept, or did that come later in the development? 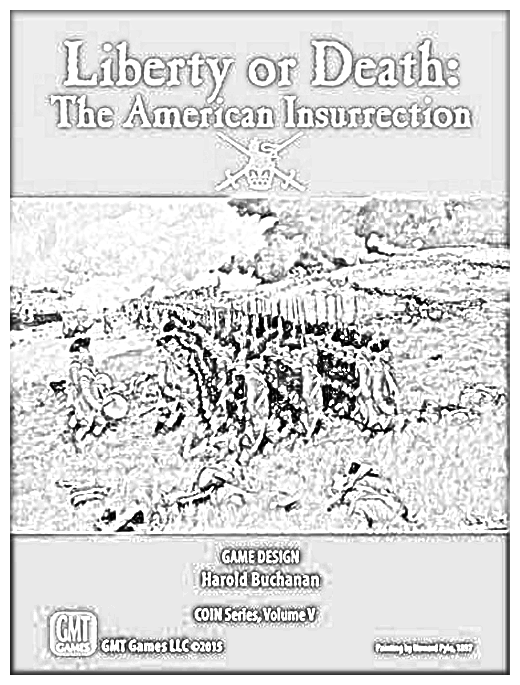 My first published full game design, Wilderness War, had no solitaire system, no bots, and it had not occurred to me nor mentioned to me by anyone else to design any. My second full published design, Labyrinth: The War on Terror, 2001 – ?, had a single bot, for the Jihadist side only, so that players could play as the US side against the game system. It was my first attempt at a bot that would be more fun than work to use. I only attempted that to answer GMT’s concerns that some players would not want to play as “the terrorists”. In Andean Abyss then, my next design, I tried to push the solitaire envelope further by providing not just 1 but 3 unique bots in the box. 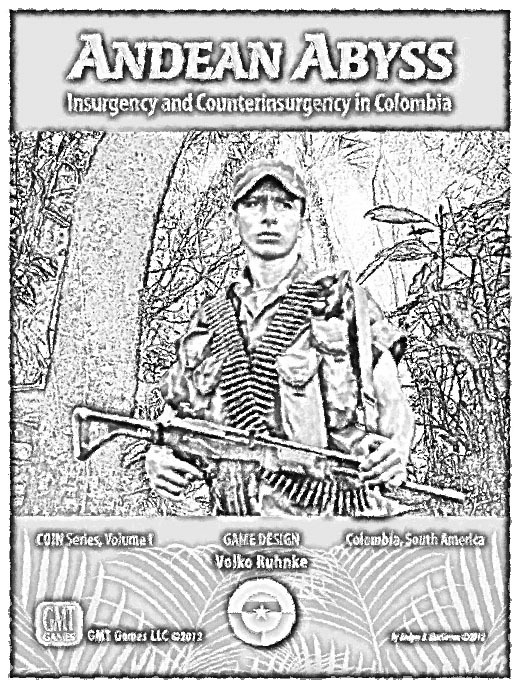 My ambition was to provide a multiplayer-like experience to the solo gamer, as well as to allow 2-player and 3-player games that filled out all four major roles in the Colombian conflict independently. The Government had arguably the most challenging menu of operations to execute, so I assigned that role always to a player. Those multibots seemed to work, so Gene requested that the next volume in the Series also feature bots (I at first had thought to go simple and not do any). Cuba Libre co-designer Jeff Grossman believed that players would want to solitaire as the historical winner, 26July, which meant doing a Govbot. We already knew how to do insurgent bots, so I set out to design bots for all 4 factions in the box. Oerjan Ariander appeared and we worked on the four Cuba Libre bots together, and the rest is known. 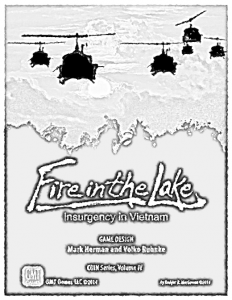 GH: Many of the COIN games cover conflicts that include a decent amount of conventional battles, like Liberty or Death and Fire In The Lake. How challenging is it to abstract out the conventional battlefield from the other results and actions that characterize most insurgencies? VR: Challenging. Covering such massed armies fighting was not an original intent in the Series, you will see if you consider the four originally envisioned topics that I listed above. The main challenge concerned the fact that such big battles—unlike the guerrilla warfare of modern Colombia—yielded major consequences to a national-level campaign over the course of a chaotic day or week. Combat in the early COIN Series is mostly deterministic, with the idea that—while small engagements are highly chaotic—the accumulation of many, many small guerrilla and counter-guerrilla engagements produce a bell-curve of results that is in essence deterministic, can be forecast effectively, and therefore accounted for in strategy. 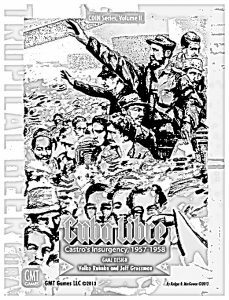 Fortunately, the chaos of card-based initiative and the interactions of the operations menus and events provide sufficient chaos to put the outcomes of big clashes in considerable doubt (because it is hard for players to foresee who will get the jump on whom in a given space). For the pre-industrial topics, 18th-Century black powder battles or ancient clash of sword and shield, each COIN Series volume reaches for different (and more detailed) modeling solutions. I enjoy seeing how each designer has approached this particular challenge in his own way, and I hope that players will also! A related challenge is that big battles tended to impose consequential losses on both sides, an aspect simplified out of COIN volumes I-III. Again, each subsequent volume handles this aspect differently. 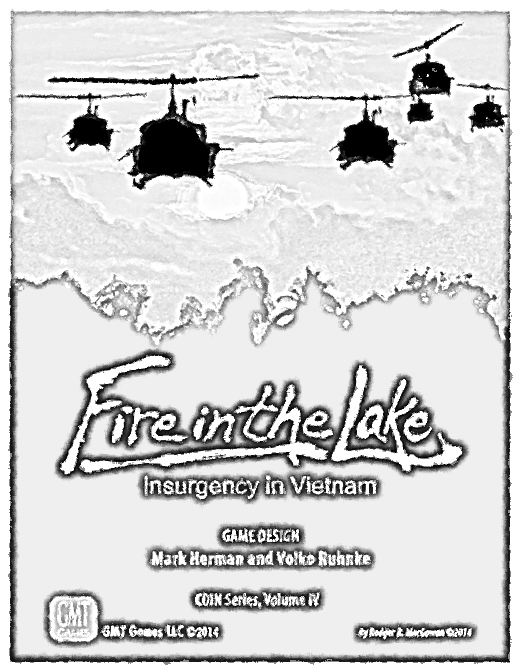 Fire in the Lake’s big NVA-versus-US battles in Vietnam do so with the least fuss, with a mechanic representing US defensive firepower, the credit for which goes to Gene Billingsley, who rightly insisted that Mark Herman and I somehow model the losses that Communist forces took when on the attack. GH: You recently took Fire in the Lake to the Army War College. What was your biggest takeaway from that session? What was the biggest criticism they had about the playing of the game and the decisions the participants had in front of them? What was your best lesson that you took away from that session? Based on you discussions with COL Hall, are we going to see more of these games worked into the curriculum up there? VR: We spent just a portion of an afternoon playing Fire in the Lake with War College students, many of whom had not board wargamed before. Their comments and questions during our hot wash showed that this simple “abstract area control Euro” evoked in them the frustrations of Vietnam-era strategy that I believe Jerry Hall intended. They also grasped the simplifications in the game—known, deterministic Pacification results came up—that served in this format as a vehicle for us to discuss the nature of such fundamental challenges of 20th-Century counterinsurgency such as the impossibility of reliable polling in insurgent-contested countryside. 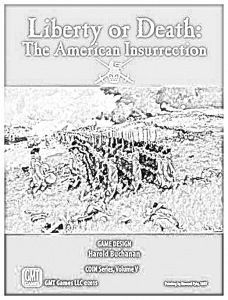 The experiment at the Army War College help affirm for me the value of the relatively small investment in commercial board games—when well facilitated—for higher level learning, particularly with regard to the lessons of historical cases for modern strategy. Yes, Jerry intends a series of such events into early 2017. As I write, Brian Train will have Colonial Twilight there in a session similar to mine with Fire in the Lake. I suspect that Mark Herman will do the same, perhaps with Churchill or Pericles. Also, work has started elsewhere on the Angola game that I originally had wanted to design for the Series. And there are some many other unmined topics, because so many historical periods were rife with internal war, factionalism, and the effects of human terrain. Medieval Europe, Renaissance Italy, the Thirty Years War, WWII Yugoslavia, … Well, one could go on. I receive ideas and proposals for such COIN volumes almost weekly. Sometimes those proposing them are willing to try to design themselves. A few of those go on to produce playable prototypes. And some of those are great. And of few of that subset of designers are willing to go through the hard effort of testing, refining, and finishing a publishable design. Marc Gouyon-Rety is one such rare designer. I absolutely adore his Pendragon—The Fall of Roman Britain, COIN Series Volume VIII. I know that COIN fans will too. Will there be a COIN Series Volume IX, and if so what? No design is yet far enough along for me to say. 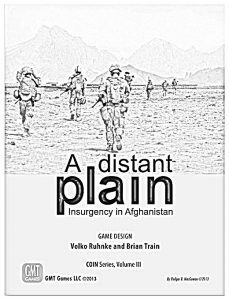 GH: Any thoughts on a COIN game that tackles a hypothetical future insurgency that hasn’t happened yet? VR: Not outside of those impeded by intellectual property licensing barriers! The challenge for me there is that I am no writer of fiction, and a key to successfully gaming such a hypothetical setting is coming up with an engaging, coherent, and detailed setting. GH: What should we have asked if we’d known what to ask you? VR: “When can we get Pendragon?” Look for it in 2017. GH: Thanks for joining us!